Embeds a Google Map full width into your website homepage or a new specific page using map markers with personalized location pin icons (per category). 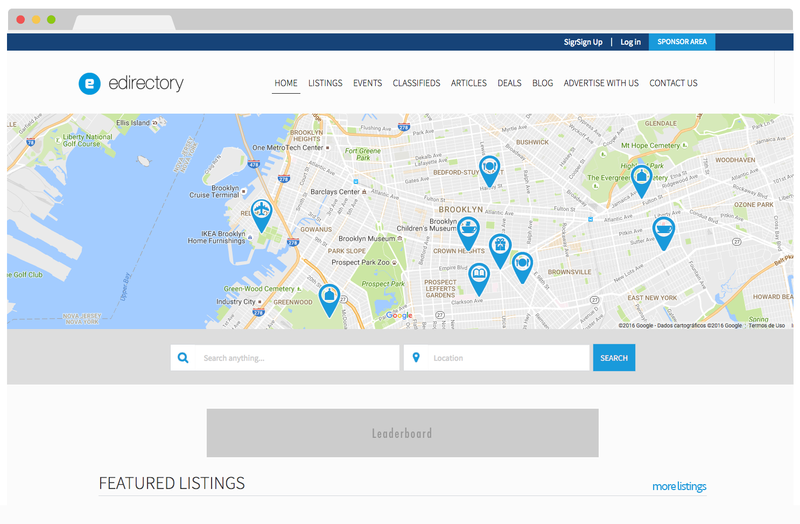 This powerful new module enables a map search functionality using Google Maps which displays all listings near the site user's location and allows the user to move the map or change the zoom and refresh the results as well. This featured map module is embedded on your homepage, or a specific page or your choosing. You also have the option here to use personalized map markers based on the listing categories, great way to enhance your brand image and set yourself apart from the rest! So when a marker is clicked on, a box will appear and show all listing information and a link to see their detail page if available. Options to set the map type (street, satellite, etc), center location, size, zoom level, navigation controls and more!